Two weeks ago now Jon and I had the pleasure of trying out The Artisan Bistro in Chelsea. It’s not a part of London Jon and I would usually find ourselves in so we took the afternoon to explore the neighbourhood before heading off to the restaurant later in the evening. We were greeted by Plamen (owner and manager of the restaurant) and he quickly seated us at the best table in the house right in front of the large open window out on the street. It was the perfect spot for a warm summer’s evening to be filled with good food, good wine and, of course, people watching. 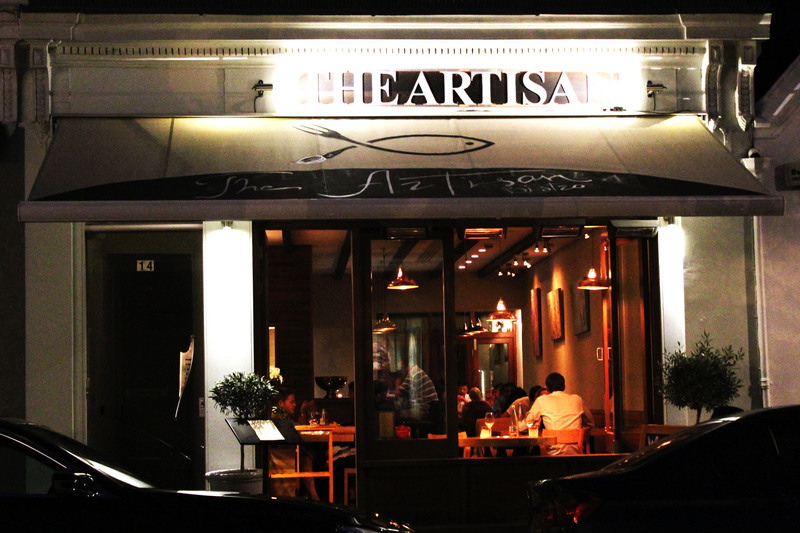 The Artisan Bistro is located on Hollywood Road (just off of Fulham Road). The area is quite quiet and residential with the prettiest of town houses, mews and cottages dotted with parks and tree lined roads. As you turn onto Hollywood Road itself you find independent cafes, pubs and restaurants (including the popular Brinkley’s). When you arrive, The Artisan Bistro has all of the effortless style and sophistication you’d expect from a Mediterranean restaurant in this area. The restaurant has a relaxed, chilled out vibe, and is beautifully adorned with artwork from local artists which can be purchased should something take your fancy. After we’d been greeted by Plamen and sat down we went through the menu which is made up of small plates / starters, main dishes and then desserts. All of the produce comes from small, local, artisan producers, with the menu changing daily depending on the ingredients that can be sourced that day. It’s something Plamen is clearly passionate about and sets this restaurant apart from most. All of the staff were relaxed, friendly, and happy to answer any questions about the menu and to provide recommendations (we struggled to choose by ourselves!) After a sip or two of the 2015 Gavi di Gavi, Enrico Serafino from Italy (a zesty, crisp white wine) Plamen had recommended, we were ready to choose our meal. The vegetarian selection at The Artisan Bistro is absolutely fantastic. The small plates / starters menu has a wide selection and Jon was somewhat spoiled for choice. 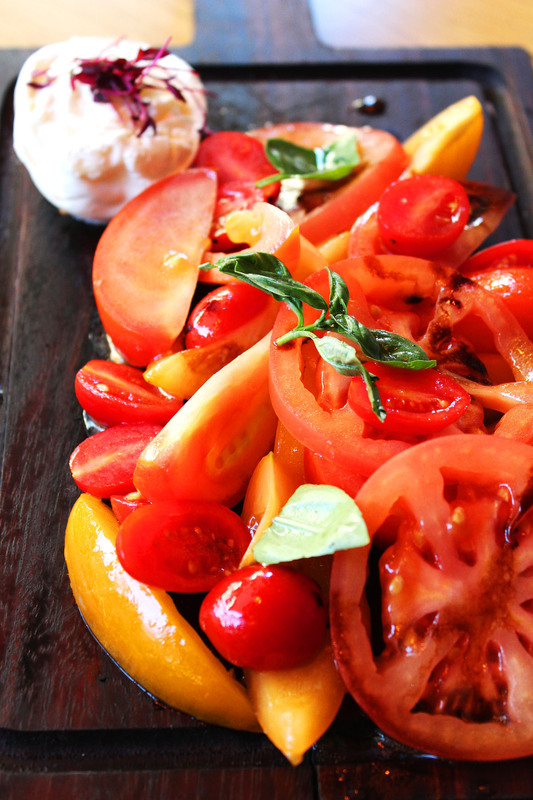 Eventually he settled on the Caprese Salad made with heirloom tomatoes and a huge chunk of fresh burrata. Plamen admitted that the tomatoes were one of the only ingredients on the menu that isn’t actually produced in the UK as the taste of Italian tomatoes is just far, far superior. And I think for that I can forgive him. Having a menu that is almost entirely sourced from the UK is an incredibly impressive and admirable feat. Having tasted the tomatoes I can also say he made the right decision – I don’t think I’ve ever tasted tomatoes quite like them! Each tomato had a unique flavour though they all tasted of warm sunshine. You could tell they’d be grown and nurtured in a hotter clime. Their earthy flavour contrasted really well with the deep, pungent basil which was then perfectly balanced out with the milky burrata. I’m a huge fan of soft cheese and burrata is definitely a favourite. Although the Caprese Salad is only assembled with a few basic ingredients it’s not a boring dish. Instead each ingredient is given it’s chance to shine. For my starter I had a duo of oysters. Two large, meaty West Mersea Rock Oysters served with spicy sriracha sauce and creamy cubes of avocado. The large bowl of ice they came in was a striking way to present them. 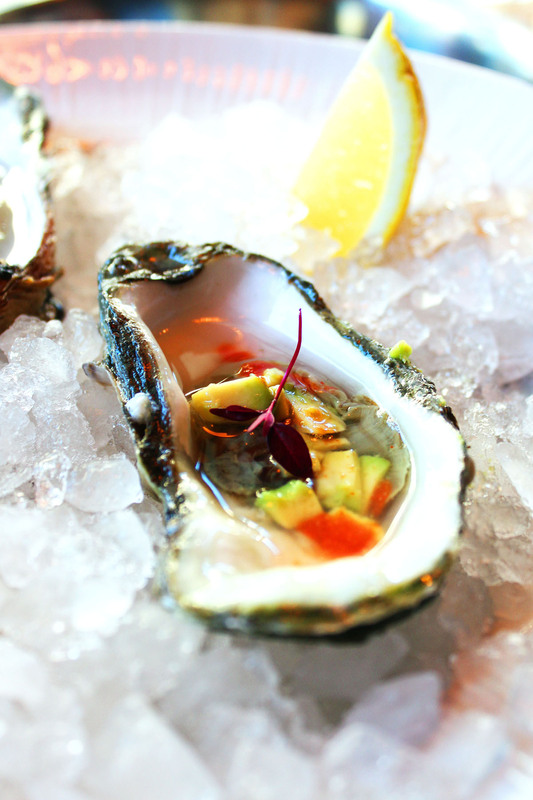 The red of the chilli and green of the avocado brings a vibrant sparkle to the grey of the oysters. I happily slurped them down. Trying to savour the salty taste of the sea alongside the bright flavours they’d been served with. All in all the dish was incredibly balanced and a great way to start the meal. After a few more glasses of wine and a little more people (and super car) watching, out came our main courses. Jon went for the Spinach Risotto (the only vegetarian main on the menu) and after struggling to decide between the Lobster Mac and Cheese (Plamen’s favourite) and the Lobster and Mussel Linguine I opted for the latter. Seafood is something The Artisan Bistro does really well. The UK doesn’t do enough with the seas around it’s coastline and the Mediterranean recipes are a great way of celebrating British seafood. 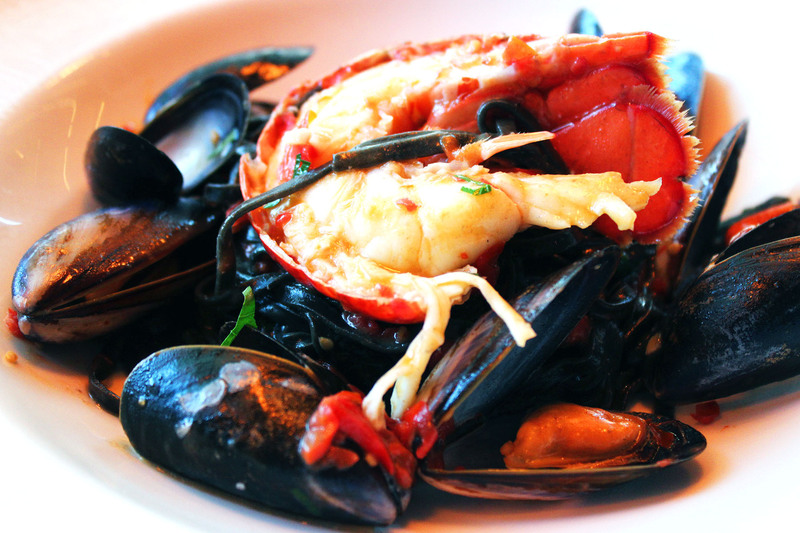 The mussels and lobster forming the main bulk of the linguine were buttery and sweet. The squid ink linguine gave just the amount of bite and texture against the soft, succulent seafood. It also produced stunning contrast against the bright orange lobster and the mussels. The sauce was perhaps more cheesey than I expected but that certainly wasn’t a complaint. 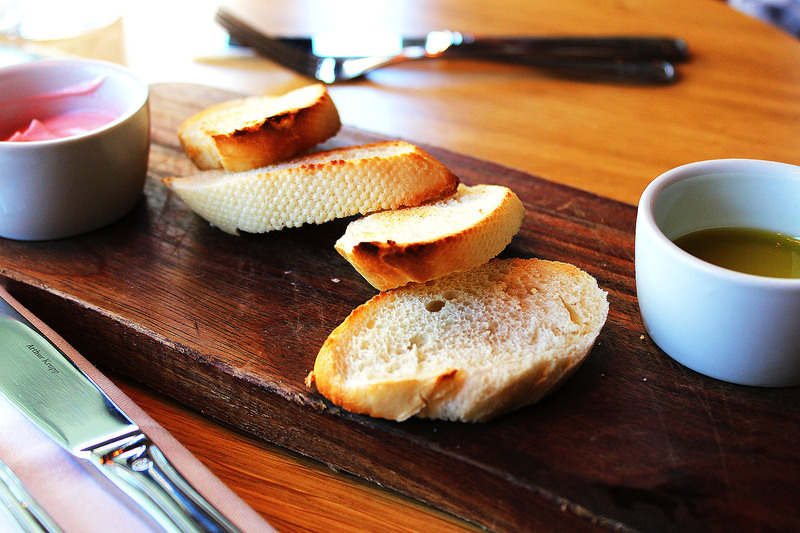 People often presume cheese and seafood don’t go but the rich, salty flavour of the cheese. There were a couple of mussels that hadn’t quite opened fully. It was too difficult to prise the shells open so I did leave a couple which was a shame. Although Jon only had one choice of main he was very pleased with the dish he was served. 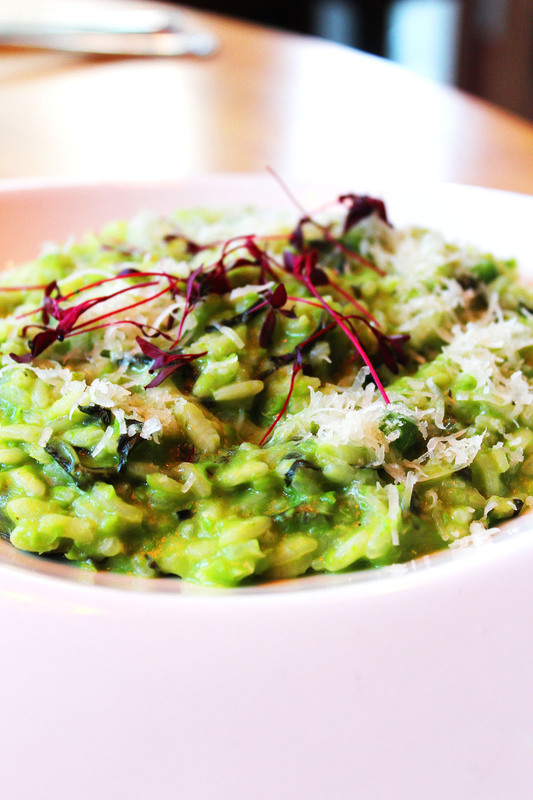 The Spinach Risotto was a bright, vivid green and had the most fragrant flavour of fresh, summer peas. The green risotto was earthy and chalky. It had been cooked just right with plenty of bite, sticky and not too wet. After more chatting away with Plamen, some good giggles as we watched Chelsea life unfold outside Brinkley’s over the road, we decided it was probably best to share a pudding and if we were only going to try one pudding it would have to be The Artisan Bistro’s infamous cheesecake. Made with a light sponge base and whipped with light fluffy ricotta it was a milky dream. 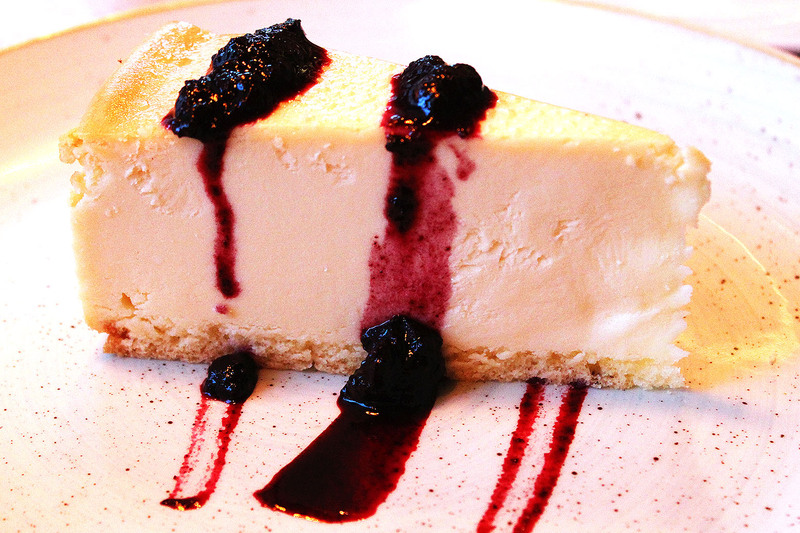 While most cheesecakes are overly sweet and cloying this cheesecake was a breath of fresh air. Topped with a sweet and sticky blueberry compote it was the perfect way to end a delicious meal. Due to its location and the fantastic quality of food, you’d be forgiven for thinking you’d be faced with a rather large bill at the end of a meal here. I’m pleased to say however the food is actually fantastic value for money and whilst some of the main meals do creep into £20+ per head there are plenty of lower priced options with even the lobster mac and cheese come in at just £16. Small tapas style bites start from £2.50 and wine and cocktails from just £5! Considering the produce is all local and comes from artisan producers I’d be more than happy to pay a little more so for now I’m not complaining! The lobster mac and cheese and their brunch served in the courtyard garden out back. Will you be joining me? I was invited to enjoy a meal at The Artisan Bistro free of charge. Whilst I didn’t pay for my meal, I am under no obligation to write a positive review and all opinions are my own! That sounds like my kind of eatery! I’d be all over the lobster mac and the truffle fries. We’ve actually got some pretty amazing heritage tomatoes being grown by a wonderful small producer in Aberdeenshire at the moment so it is possible in the UK. Lobster mac and cheese and truffle fries just sounds sooooooo good doesn’t it Claire! Perhaps you’ll have to point them in the right direction of Artisan Bistro! I’m sure they’d love to find a producer in the UK if they could! It really was lovely Nadia. Definitely do visit if you can! The oysters sound wonderful – I adore having a little extra heat with mine! I’ve read such great things about The Artisan Bistro, bookmarking it for when I’m next stumbling around in Chelsea! Hi Connie! Oysters and chilli just works so well together doesn’t it?! Yu really should stop by some time soon. Chelsea is such a pretty neighbourhood, perfect for lazy Sunday strolls!